Overloaded with sweet potatoes? 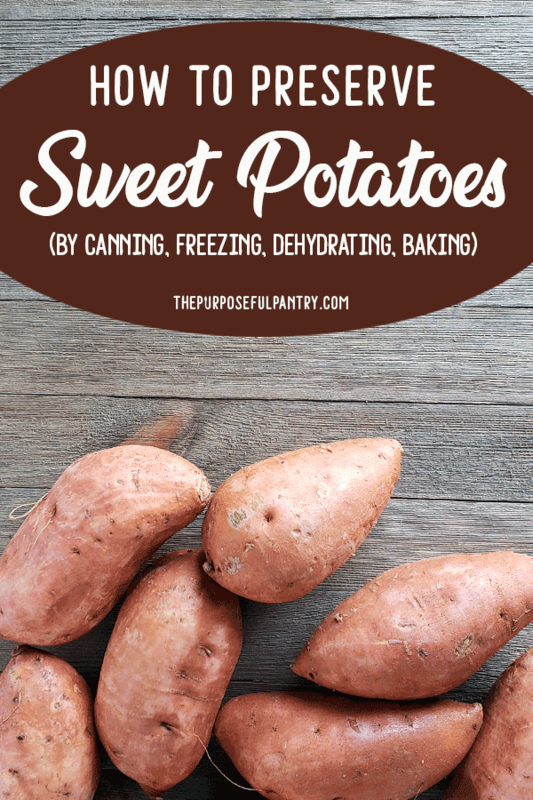 Learn all the ways you can preserve sweet potatoes to store them in your freezer and pantry – without having to use your vegetable bin. Thanksgiving brings inexpensive sweet potato prices around the country (gotta love those sales cycles!). 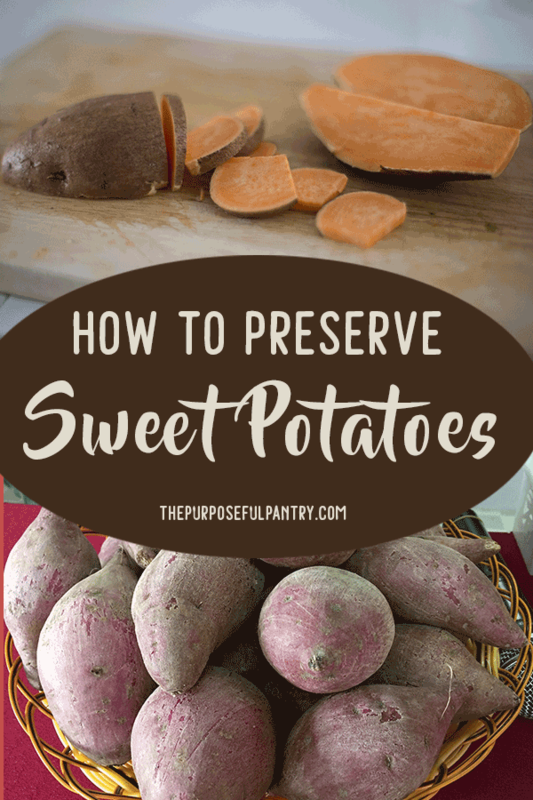 But even if you come up with a great sale in the spring or summer, or you’re harvesting more than you can readily use in a short time, preserving sweet potatoes is easy! 7 How do you use sweet potatoes? 9 TO SHOW OFF THE LOVE OF YOUR HOBBY AND YOUR STATE! Look for plump, bright potatoes with no sign of rot. You might find a white with light colored flesh or a brown/red skin with copper-colored flesh. Both are sweet potatoes, which are a tubular plant associated with the bindweed family (while potatoes are part of the nightshade family). Want to know how to grow your own sweet potatoes? Here’s a great blog post to walk you through it. Here are a few tips to grown your own sweet potatoes if you’ve never given it a try! Store for up to two weeks in a dark warm place with high humidity if possible. 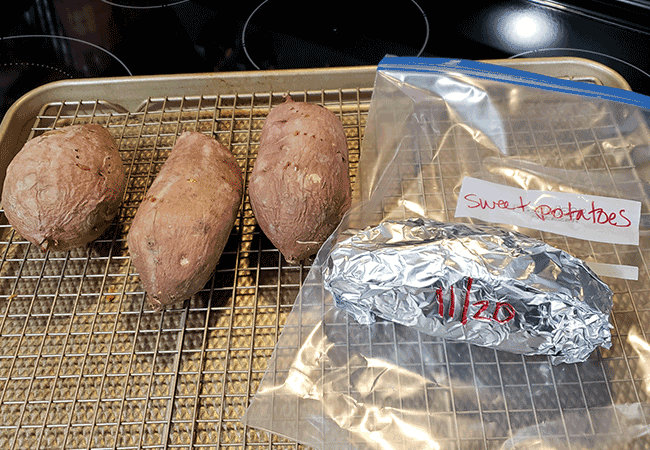 Store sweet potatoes in a cool, dry place. Do not allow them to touch each other if possible, and don’t store with other vegetables in the same bin like apples or onions, and they can affect each other in how they ripen. Use newspaper as a separator, but be sure to keep an eye out on any moisture build up. Store for up to twelve months. Wash sweet potatoes, rub in oil, poke with a fork for vent holes. Allow to cool, then wrap in foil, then place in freezer (you can put foil packs into plastic freezer bags to organize). Store up to 12 months in the freezer. Thaw for use, and add whatever you would add to make mashed sweet potatoes, or add to muffins, breads, smoothies and more as is. Sweet potato chips are a great way to use your sweet potatoes in a different way than the usual baked or sugar-laden casserole way. However, while you can keep these for a short-term, they are not for long-term storage. So know that while you might stretch the life of your sweet potato for a little while longer, this is a food you need to eat in the short-term. While it is fine to use oil to make your sweet potato chips, drying without oil gives them a longer shelf life. Spread out on non-stick dehydrator sheets or silicone mats. Dry at 135F for 8-10 hours (or until crisp) in your dehydrator. You may find that you need to flip the bark to finish drying. Simply peel it, gently, and turn over and continue the process. ► Sheets – Break apart sheets into chunks and store in an airtight container. It is helpful to vacuum seal if you will be storing for long-term. Grind when ready to use. Break apart into a strong blender and powder. Run powder through a mesh strainer and return any chunks to a blender (or put into a coffee grinder dedicated to powdering), and grind again. Store the powder in an airtight container. To reconstitute, use a 4:1 ratio of water : sweet potato powder and allow it to sit for 20-30 minute to fully rehydrate. How do you use sweet potatoes? 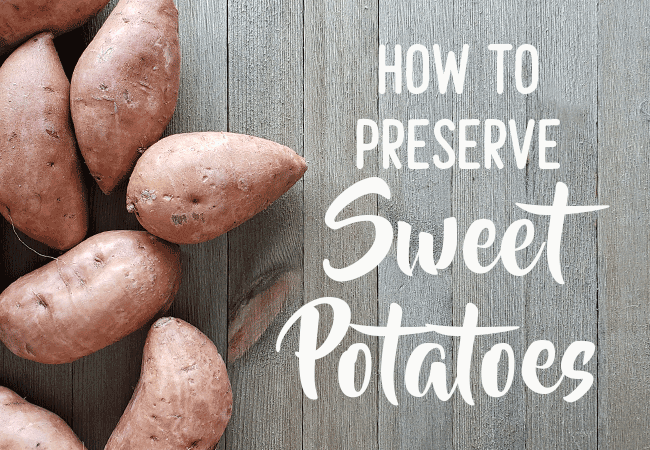 With all of these preservation methods, having sweet potato purees, ready-made baked sweet potatoes or even sweet potato dishes are just minutes away. What are some of your favorite sweet potato dishes that you could preserve sweet potatoes in the fall to make year round? 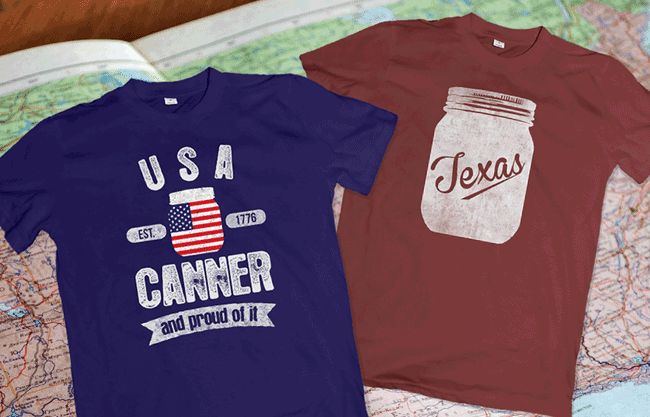 TO SHOW OFF THE LOVE OF YOUR HOBBY AND YOUR STATE! Glad it was helpful for you! Thanks for stopping in! Great information. Now I know how to keep those sweet potatoes longer the next time we have some.